The Bureau of Economic Analysis (BEA) today announced its initial estimate that the economy grew at a 3.5 percent annualized rate in the third quarter of 2018, after growing 4.2 percent in the second quarter and 2.2 percent in the first. This robust growth rate is welcome news, and is in line with recent forecasts, which expect strong economic activity in 2018 and 2019. However, today's announced fast growth is largely the result of temporary factors and is not expected to last over the medium and long term. Most forecasters project long-term growth to average around 2 percent. The 3.5 percent third quarter growth rate was a bit higher than - but in line with - expectations. 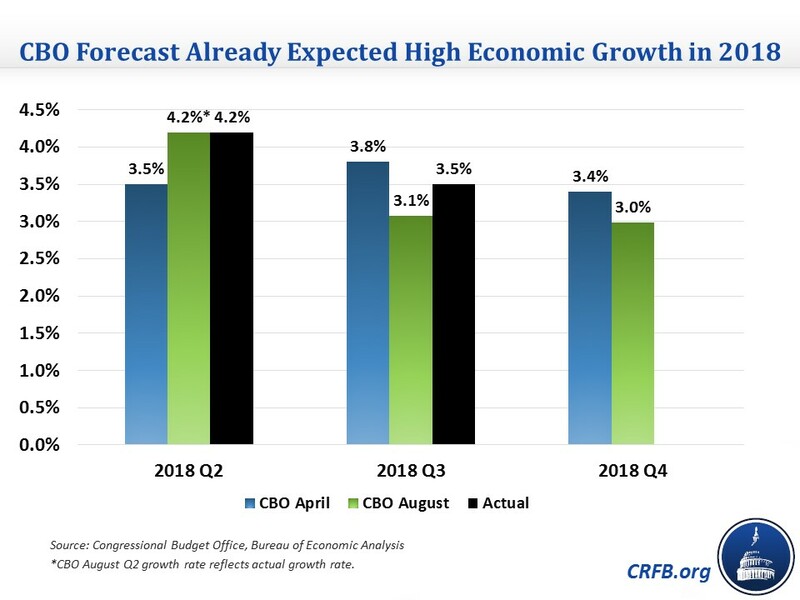 For example, CBO's April 2018 economic forecast, completed before any official 2018 growth numbers were released, predicted 3.8 percent growth for the third quarter while its updated forecast in August predicted 3.1 percent growth. Other forecasters had similar estimates, with the Blue Chip consensus of economic forecasters predicting GDP growth of about 3.3 percent, with a range of about 2.9 to 3.7 percent for the average of the highest and lowest forecasts. In addition, a survey of more than 60 economists by the Wall Street Journal estimated that GDP growth would be 3.4 percent. Faster economic growth is great news for households, businesses, and the federal government. Some of this faster growth likely reflects contributions from pro-growth regulatory and tax changes. But much of this growth clearly represents one-time factors, as we explain in our paper Can America Sustain the Recent Economic Boost?. For one, the country has continued to experience a decline in unemployment as the economy has continued to recover from the Great Recession. This year, for the first time this business cycle, CBO estimates that the economy has actually reached its potential. Some argue there is still some further room for recovery-driven growth, but our economic capacity none-the-less will limit rapid sustained growth. Perhaps more significantly, recent deficit-financed legislation has provided a short-term boost to the economy. The Congressional Budget Office (CBO) has estimated that the Tax Cuts and Jobs Act would boost the economy in 2018 by about 0.3 percentage points, and the spending increases in the Bipartisan Budget Act of 2018 would have a similar effect. We have also estimated that other deficit-increasing legislation would contribute 0.2 percentage points to 2018 growth. Most of this growth shows up in a temporary surge in consumption, which the BEA estimates contributed 2.7 percent to third quarter growth, its highest quarterly contribution to growth in nearly four years. Absent these factors, annual growth for 2018 overall would likely be closer to 2.2 percent rather than the 3 percent that is expected. Growth for the 3rd quarter in particular would also likely be lower without this debt-fueled boost, though it is too soon to estimate by how much. In addition, third quarter growth specifically was boosted by unusually strong inventory growth, which contributed 2.1 percent to GDP growth, though that was somewhat offset by an unusually large trade deficit, which subtracted 1.8 percent from growth. Unfortunately, the roughly 3 percent growth we have seen so far in 2018 is not likely to last over a longer period of time. An economy cannot operate above potential capacity indefinitely, and the sugar high is expected to fade. Over the long term, potential GDP growth will be constrained by the aging of the population, which already has and will continue to constrain labor force growth and investment. As our paper How Fast Can America Grow? outlines, achieving 3 percent sustained growth would require a very unlikely amount of rapid investment and/or productivity growth to overcome population aging. Consequently, most economic forecasters expect that the economy will grow at about 2 percent over the long term. 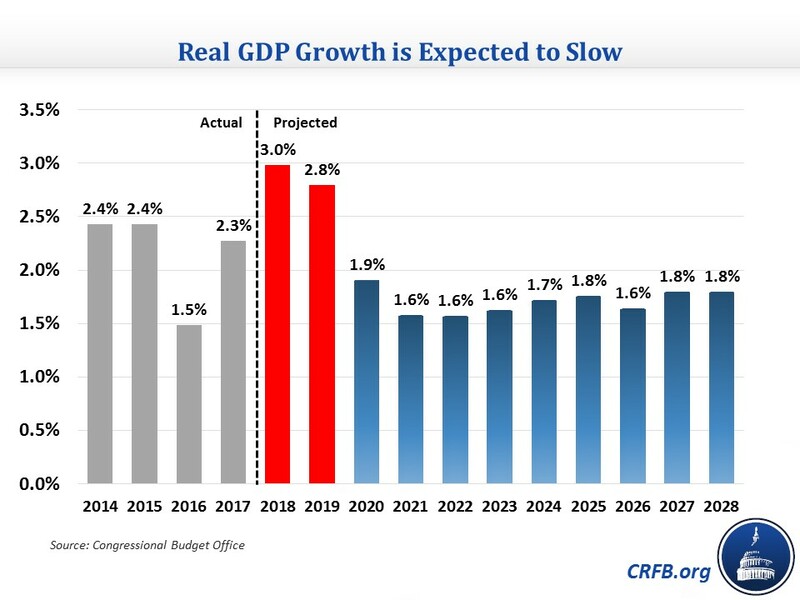 CBO projects that growth will dip below 3 percent by early next year and dip below 2 percent, where it will remain, by 2020. Over the 2019-2028 period, growth will average 1.8 percent. The same survey of economists by the Wall Street Journal that forecast 3.4 percent growth for this quarter also forecasts annual growth to fall to 2.4 percent by January 2019 and 1.8 percent by January 2020 and 2021. 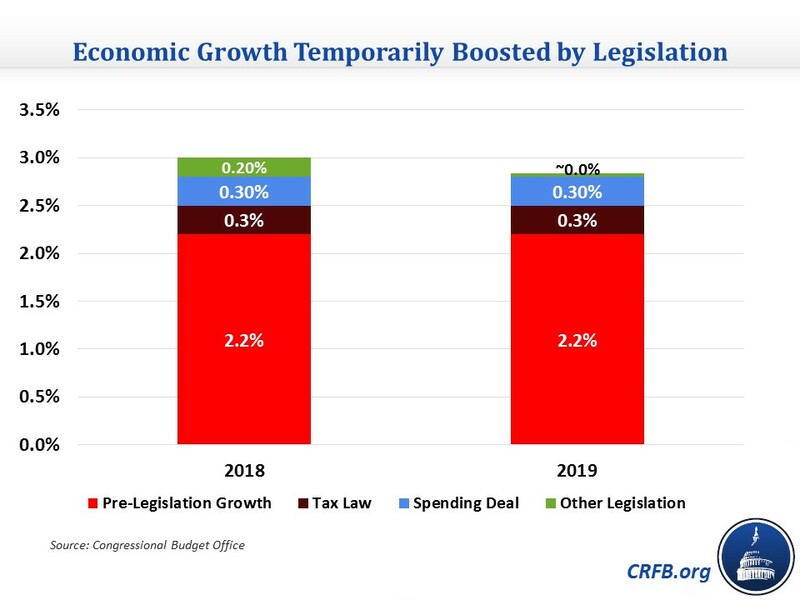 To be sure, pro-growth policies could help increase long-term growth, but even enacting several of these policies would likely only increase growth by a few tenths of a percent per year, not enough to lift growth to 3 percent. The rapid growth of the last two quarters may continue for several more quarters, but is unllikely to last over the medium- and long-term. Policymakers should pursue pro-growth reforms in order to promote faster growth; that agenda must include getting control of debt so that our fiscal burden does not threaten long-term growth.